I’m so proud that my book “Not Afraid of Life” with Nancy French became a New York Times best seller. It’s been wonderful to tell my story to such wonderful readers and to get all of the heartfelt feedback. Haven’t had a chance to read it? Join the conversation by purchasing a copy through Amazon, Barnes & Noble, or Books-a-Million today! The oldest daughter of Sarah Palin and single mother goes beyond the headlines, offering readers an inside look at her life, her world, and the things that matter most, including her family and the faith that keeps her centered. When her mother became the Republican Vice-Presidential candidate in 2008, Bristol Palin was instantly propelled into the national spotlight, becoming the focus of intense public and national media scrutiny at the age of seventeen. 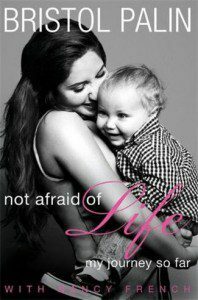 In Not Afraid of Life, Bristol gives readers an intimate behind-the-scenes look at her life for the first time, from growing up in Alaska to coming of age amid the media and political frenzy surrounding her mother’s political rise; from becoming a single mother while still a teenager to coping as her relationship with her baby’s father crumbled publicly—not once, but twice. Bristol talks about the highs and lows of her appearance on ABC-TV’s Dancing with the Stars, including the aching hours of practice, the biting criticisms, and the thrill of getting to the show’s finals. She speaks candidly of her aspirations for the future and the deep religious faith that gives her strength and inspiration. Plainspoken and disarmingly down to earth, Bristol offers new insight and understanding of who she is and what she values most.